Räsymatot ja virkatut matot ovat yksi perinteisimmistä kierrätyksen muodoista. Tässä muutama hurmaava esimerkki nykyajan "mattomuodista". Rugs are probably the most traditional way of recycling. Here are some modern versions. This is a part of a bigger Treasury list I made with my other Etsy account. 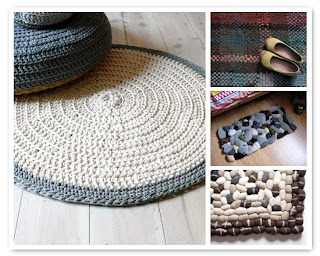 Wonderful Rugs! What a great way to recycle!